West Indies starts their first inning batting from 31/1 in day 3. Shami looks impressive in first session as compare to other bowlers. Bishoo andÂ Kraigg Brathwaite starts well of the inning and both Bishoo just try to survive as long as he can but unfortunately Bishoo stumped out on the bowling of Mishra. Bishoo made 12 runs. After Bishoo, Darren Bravo came to crease and he try to make partnership with the Kraigg but Kohli bring back the Shami back to attack and he did for India. Shami looks like old west Indian fast bowlers, taking bounce and swing from the pitch. He took edge of Bravo and Saha did the rest.Shami strikes just before lunch. After Lunch samules came to crease but from first ball he faced, he looks like not in touch and shami got the edge of samules to just after lunch. After Samules,Â Blackwood came to crease and Shami got him out in sleep by great bouncer. Then Kraigg andÂ Chase make some partenership but Yadav's bouncer got the wicket of Chase as he try to pull the bowl and gone straight to Kohli. After this Yadav looks like back in the form and he took the edge of the Kraigg on a unplayable bouncer and it was best wicket of the match. So at the tea West Indies score wasÂ 157/7. 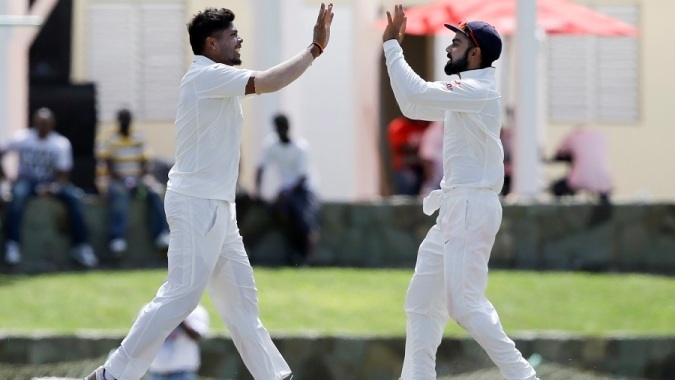 After tea Jason Holder andÂ Dowrich make a good partnership and put up 50 run partnership for the 8th wicket and helped to cross the west Indies score over 200. After the tea both played well but Yadav and Mishra do the rest after that and West Indies got all out on 243 and got the lead of 343 runs. In second inning Ishant got the lbwÂ of the highest scored of first inning he got the Kraigg out and got some relief to India. West Indies score 21/1 at end of the day. India have a great a chance of Inning and with few runs left.